Does Your Elevator Pitch rise to the top, or sink to the Basement? At a recent networking event, the host asked each person to give a brief elevator pitch about their business. As I listened to each person’s pitch, it reminded me of the movie Groundhog Day with Bill Murray. I’m pretty sure that the people were taking turns, but at some point it seemed like people were just repeating what the previous person had said. Each attendee only described what they did. The best Elevator Pitch shouldn’t explain what you do, here’s why and how to fix it. Some elevator pitches are destined for the basement…. On a freight elevator. Here are examples of what I call a basement elevator pitch. One person said she was a partner with a full-service law firm. Another said he was with a cutting-edge accounting firm (really?). The third person said, “We sell cloud services.” I’m pretty sure that means that they provide cloud-based information technology services. I say that only because I’m not familiar with any “service” that clouds in the sky might require. Let’s say your car makes a clicking sound when you turn the corner on the way home. When you get home and open a browser on your computing device of choice, what do you type? My guess is that you don’t type “Innovative, licensed auto service center with three locations.” Most of us would type “clicking noise while turning” and probably include the make and model of the car for precision. Essentially, we type a description of the problem we are having, not the solution. So, if your elevator pitch talks about WHAT you do instead of WHY people might need what you do, then your message is likely falling on deaf ears. A great Elevator Pitch starts with an Elevator Rant. To help explain the Elevator Rant, imagine this scenario. You are on an elevator to the 40th floor when the doors open on the second floor and two people from your ideal client get on. It turns out they start complaining about something you or your company are the best resource to solve their problem. What do their complaints sound like? I used to call this “The problems you solve.” My good friend, Bob London of London Ink, coined a term Elevator Rant – which is now my favorite term. The elevator rant for a client of an IT Cloud Services Firm might sound like “We are sick of not being able to access our systems reliably from outside the office, and we spend a fortune maintaining systems that were supposed to save us money.” The first part on an elevator pitch based on this concept would be “Our clients come to us when…” and then insert the rant. I had the pleasure of being interviewed by Tom Cooper of Brighthill Group recently to discuss challenges for professional services firms when it comes to sales and business development. You can listen to the podcast here: “Dump your elevator pitch. What you need is a great “Elevator Rant!”. Tom did a great job of drawing out some concepts that we cover in detail in my next book, Same Side Selling, launching launch in early 2013. 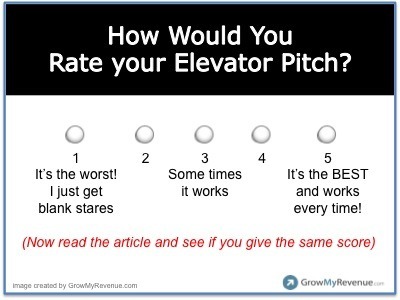 Share your rant-based elevator pitch in the comments. I’ll give feedback on each one submitted, and others will get a sense of where you add value. This is a great article and has got me thinking about my own elevator rant. Normally I introduce myself by saying “I’m a former opera singer who teaches public speaking”. It captures people’s attention because the “opera singer” bit is unique, and the “teaches public speaking” part people resonate with because A) they’re scared of public speaking, and B) they never met anyone who teaches it. It usually starts a great, personal conversation about how that person feels about their public speaking skills. I’d love your feedback. Thanks! I love the hook that you use with your background as an opera singer. It certainly caught my attention and made me want to learn more. Your tagline explains what they can expect as an outcome, but may not tap into their rant to get their attention and spark a conversation about how you could help them. So, it might be in your case “People come to me when they are not comfortable with public speaking and it is either part of their career, or doing it poorly could be bad for their career. They come to me to help them command the stage.” Since you would have already mentioned your opera background, commanding the stage will not require further explanation. I’ve done some research on how executives make decisions, and the first thing they want to know is “Why do I need it? What problem does it solve?” Start there, and you make it easier for them to appreciate your value. Thanks for sharing your ideas. That opera singer opening is a great way to spark discussion. So true, Ian! In fact, I always teach coaches and consultants to “ditch the elevator pitch” and opt instead for sharing conversationally, in a way that’s natural to your style, WHO YOU HELP and WHAT YOU HELP THEM TO DO. I’m so happy you dropped by. A focus on WHO YOU HELP is very valuable. WHAT YOU HELP THEM TO DO might get them wondering why they need it. For example, if a coach says “I help leaders communicate better with their team,” it all sounds good. But, if instead you said “Executives come to me when their teams appear to be working hard, but not accomplishing the right objectives. They appear confused about their roles, and sometimes just wait for instruction.” In this way, you are demonstrating the “symptoms” that you can help them diagnose and then recommend your “treatment” in the form of WHAT YOU HELP THEM TO DO? Does that sound like it might be worth a shot? I’m honored you dropped in and shared your wisdom. We provide several specific solutions that I find difficult to describe in a summarized manner. I’ve attempted to answer the question… what do you do and how does it solve my pain. I think it could use improvement and would love your comments Ian! Clients come to us when they need to combine their payroll data with other types of data to accomplish complicated reporting issues. We hear CFOs say they are sick and tired of not knowing with any certainty, the variances between budgets and actual payroll data. Other companies tell us they struggle to successfully consolidate data from their various payroll platforms for retirement reporting or to easily combine data to populate total compensation statements. They appreciate that we are one of very few official ADP partners who have developed a secure MR file transmission that automatically imports their data into Insight e-Tools. Does any of that resonate with you? Great start. Thanks for stopping by. If you think about the client’s rant, I doubt they would say “we need to combine our payroll data with other types of data to accomplish complicated reporting.” It would be nice, just not likely. In other words, don’t talk about the solution. Their rant probably doesn’t include anything about an ADP partner 🙂 Given how innovative your team is with your solutions, if you strike a chord with the problem they face, they’ll ask YOU about the solutions. As always, your thoughts are tremendous help! Thanks Ian.